Shares of Boeing declined 13.5% to $365.55 as of 9:32 a.m. ET. The aerospace giant’s stock was up 31% for the year-to-date through Friday. The cause of the crash has not yet been determined. However, the Digital Flight Data Recorder and Cockpit Voice Recorder of the flight have been recovered, Ethiopian Airlines said in a Twitter post Monday morning. The Federal Aviation Administration said Monday that it was on-site with the National Transportation Safety Board investigating Ethiopia Flight 302. 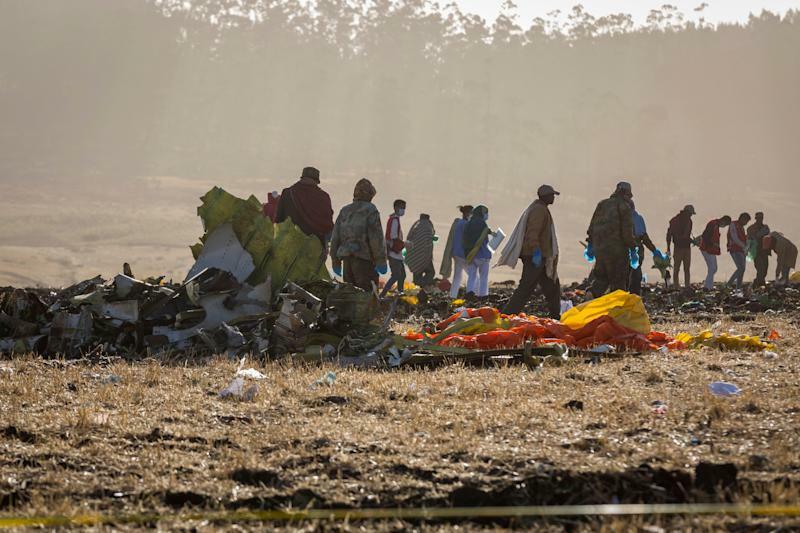 The Boeing aircraft involved in Sunday’s deadly crash had been delivered to Ethiopian Airlines in November, had flown 1,200 hours and was last maintained in early February, according to Ethiopian Airlines group CEO Tewolde Gebremariam. This marks the second time in less than six months that a new Boeing aircraft crashed within minutes of departure. In October, a Lion Air 737 Max 8 carrying 189 people went down over the Java Sea and killed all those on board. While both crashes are still under investigation, there is no evidence of a connection between the two. Airlines in Ethiopia, Indonesia and China grounded their Boeing 737 Max 8 fleets on Monday as concern over the safety of one of Boeing’s newest aircraft mounted. “Given that two accidents both involved newly delivered Boeing 737-8 planes and happened during take-off phase, they have some degree of similarity,” the Civil Aviation Administration of China (CAAC) said in a statement. Chinese airlines comprise more than one-quarter of the global fleet of the Boeing 737-8 aircraft, according to Reuters. Other countries have telegraphed that they are taking extra precautions in the wake of the deadly crash. Cayman Airways announced that it was temporarily grounded its two Boeing 737 Max 8 aircraft, effective Monday, until more information is received on the investigations. Turkish state-run carrier Turkish Airlines in talks with Boeing and is following the developments of the investigations, CEO Bilal Eksi wrote in a Twitter post Monday. South Korea is carrying out a special investigation of the aircraft, after the carrier Eastar Jet became the first in the country to take delivery of a Boeing 737 Max 8. India’s Directorate General of Civil Aviation said on Monday it will issue safe instructions Monday or Tuesday for Indian carriers operating the aircraft. Monday afternoon, Morocco’s national carrier Royal Air Maroc temporarily grounded its sole Boeing 737 MaX 8, according to a Reuters report citing an unnamed official. Many airlines in the U.S. have continued to operate the aircraft, including Southwest (LUV) and American Airlines (AAL), which have some of the largest domestic fleets of 737 Max 8 aircraft. “As Southwest operates a fleet of 34 Boeing 737 MAX 8 aircraft, we have been in contact with Boeing and will continue to stay close to the investigation as it progresses,” a Southwest spokesperson said in a statement. “We remain confident in the safety and airworthiness of our entire fleet of more than 750 Boeing 737 aircraft, and we don’t have any changes planned to 737 MAX operations." The 737 Max is Boeing’s most important aircraft model, comprising nearly a third of the company’s operating profit, according to Bloomberg. Boeing’s share declines weigh heavily on the Dow, a price-weighted index. The stock drop pointed to an about 300-point drag on the industrials-heavy index in early trading Monday. However, the Dow shook off Boeing’s declines by market close, as every other component in the 30-stock index rose during Monday’s session. This post has been updated with further aircraft grounding information.